FEAST YOUR EARS . . . Waves of sound travel through the air at about 760 mph. But what happens when they reach the human ear? Our ears process information 1,000 times faster than our eyes, and our sense of hearing is so discriminating we can distinguish more than 300,000 sounds. In fact, if our ears were any more sensitive, we would hear the random motion of air molecules bumping against our eardrums. World-renowned sensory neuroscientist Jim Hudspeth has revolutionized our understanding of how biological and neural networks process auditory inputs. Over the last three decades, his research has demonstrated how thousands of microscopic cells in the inner ear sway with vibrations, starting a cascade of neurotransmissions to the brain—translating sound waves into everything from Beethoven to Lady Gaga. 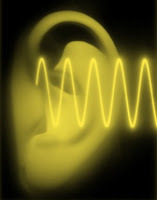 Dr. Hudspeth asks: What do we know about the sense of hearing, and how did it evolve? How is hearing different among different species? Is there such a thing as a bionic ear? Can sound-sensitive cells be repaired, regenerated, or even built to aid the deaf and hearing impaired? Co-founder of the journal Neuron and winner of numerous awards in the fields of neuroscience, biophysics, and otolaryngology, Dr. Hudspeth is the F.M. Kirby Professor at Rockefeller University, director of Rockefeller’s Laboratory of Sensory Neuroscience, and investigator for the Howard Hughes Medical Institute. JUST ADDED! Lit-hop artist Baba Brinkman opens the night with an aural report from his smash show, The Rap Guide to Evolution. Darwin got it all going on! The Secret Science Club meets Thursday, June 9 at 8 pm @ the Bell House, 149 7th St. (between 2nd and 3rd avenues) in Gowanus, Brooklyn. Subway: F to 4th Ave; R to 9th St; F or G to Smith/9th.